Hello my friends, long time lurker, first time poster! Thought I'd start in a good way. 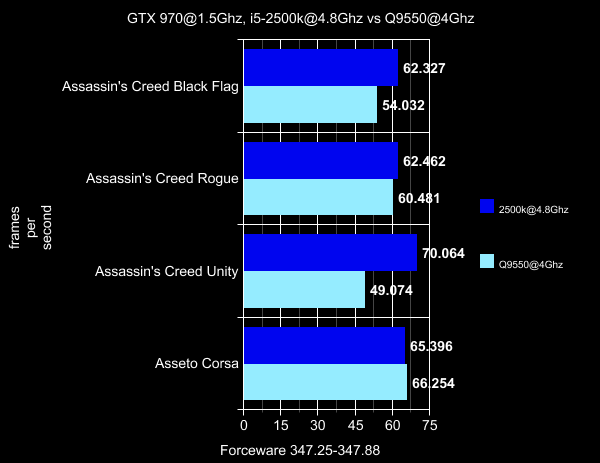 It has been quite a while since I got my GTX 970 and since I had some spare hardware laying around, I thought that it would be interesting to test how it performs paired with various cpus. Well for me certainly it is. So what I did, is benchmark this card in many games (custom gameplays and built in benchmarks), demos and stand alone benchmarks, in 1920X1080 resolution so we can see what to expect with different configurations. 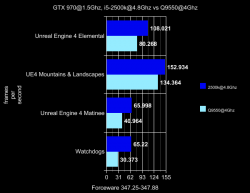 To tell you the truth, the initial goal was to create a benchmark database, with a highly clocked i5-2500k and a GTX 970 @1.5Ghz. I wanted to have benchmark results without cpu limits, so I can compare them against future cards I get. 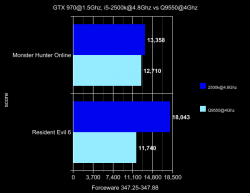 Under this scope, you must understand that this test is based primarily on a suite that was supposed to do GPU benchmarking, but since I was at it, the thought occur to see how older cpus would perform with real life gaming settings. 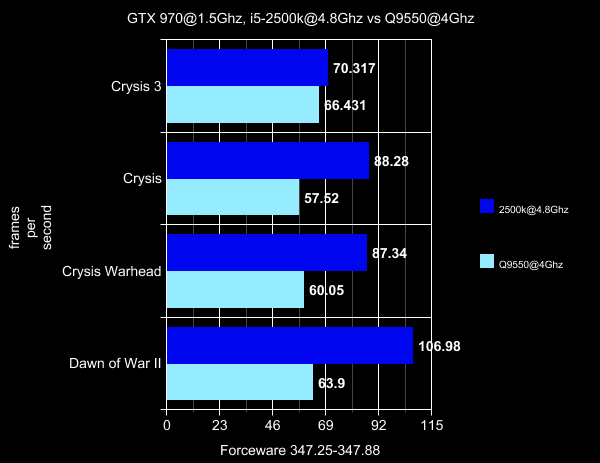 Also consider this test, a tribute to older cpus, with which we had a lot of fun. 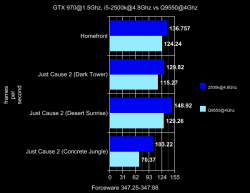 Of course since I decided to go on and test my other cpus, the benchmark suite deviated somewhat, that's why you will see framerate capped games in this suite, since after a point I wanted to see how the cpus would fair. 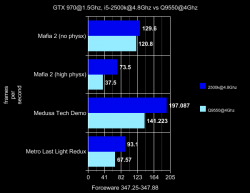 All in all then, it is a mixed test, with focus on the gpu but has the very important goal to inform people owning cpus with a varying degree of performance, what kind of gpu could their system handle and what to expect from it. 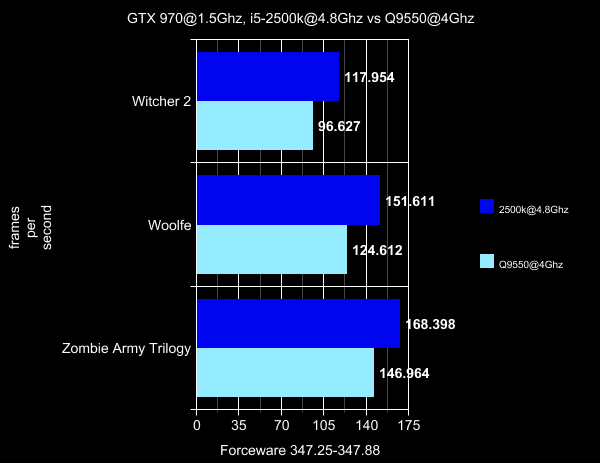 The good thing is that having this database ready, I can benchmark new graphics cards against the 970, only redoing benchmarks that are greatly affected by newer game versions or drivers. 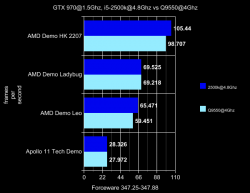 I could test similarly powered AMD graphics cards versus the 970, my 7950 CFX vs the 970 or I could just test AMD cards in cpu limited games to see how the AMD driver fairs. The possibilities are endless. But these are stories for another time. I still have this one to finish, lol. 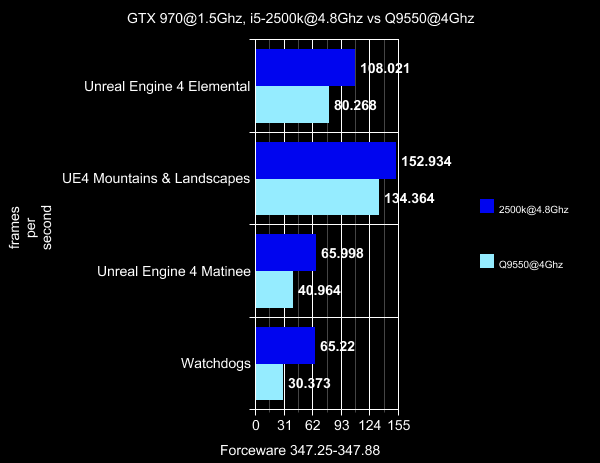 To that goal, many game engines have been benchmarked, implemented on even more, very well or less known games. 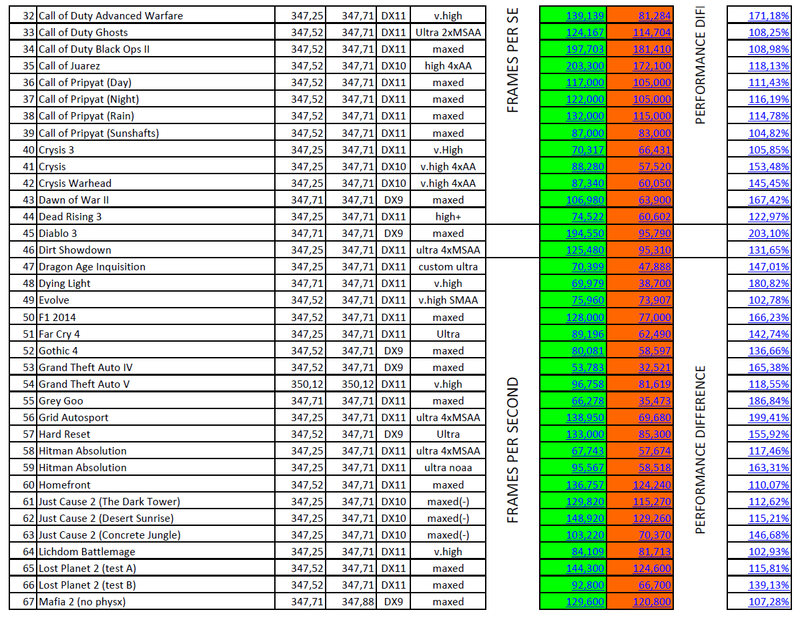 Cry Engine, Frostbite, Dunia, Unreal, Anvil, Unigine, Asura, IW6, Hammer, Chrome, EGO, you name it, all have been benchmarked! 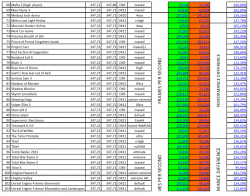 The test suite contains 70+ benchmark tests (dunno how many exactly but I guess they are more than 70 ), that have produced 108 benchmark results. 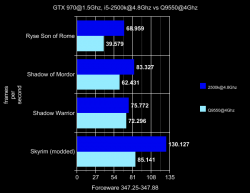 For all the tests, same settings and same game versions have been used. 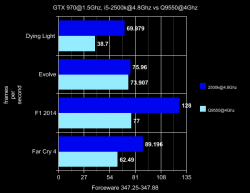 There is only one discrepancy in Far Cry 4, where I have used 1.8.0 for the Q9550 benchmark, 1.7.0 for the 2500k and 1.9.0 for the 860. According to the 1.8.0 changelog, this patch contains no performance changes, so we are OK.
and afaik 1.9.0 only added the Valley of the Yeti DLC. 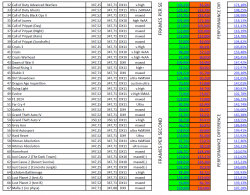 Now the semi ugly part comes to the driver versions used, because due to the sheer size of this benchmark suite, plus my Youtube uploads that took too long (will explain later), the benchmark suite has spanned four driver releases. 347.25, 347.52, 347.74 and 347.88. 350.12 has been used for all systems in GTA V, so that doesn't count. The ugly part comes to the fact that I was using the new driver as I went, so the older drivers are used on the 2500k for which I did the benchmarks first, then newer drivers for the Q9550, then went back to add some benchmarks to the 2500k and now I am still doing the 860 benchmarks which will have the newer 350.12 drivers for half its benchmarks. 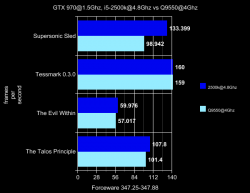 Just to come clean, I provide the release highlights, so you know what changed and how it affects this benchmark suite. So all in all, as you can see, we are OK. 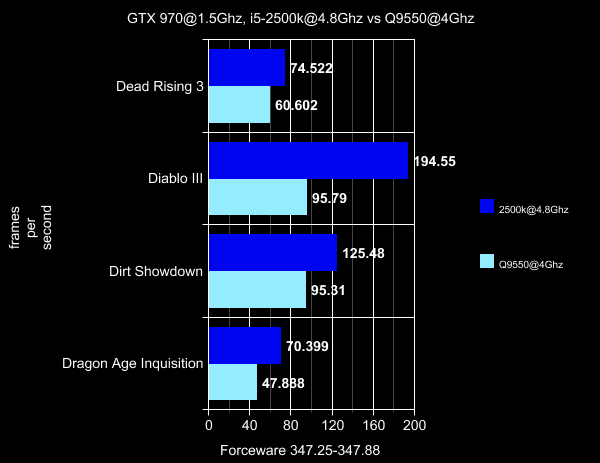 The performance improvements of 347.52 have gone to waste anyway, since the Q9550 was very cpu limited in these games. 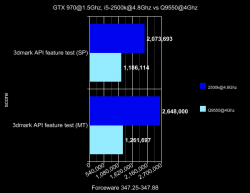 Maybe these improvements will help the 860 a bit, but we will see that in an update. Now finally the time has come for the good part. The results! I will provide the results in various ways. 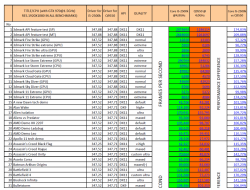 First there will be a text based vbulleting table, then some screenies from my excel file that contains the sum up in alphabetical order, sorted screenies by highest performance difference and of course graphs. Lots of them. 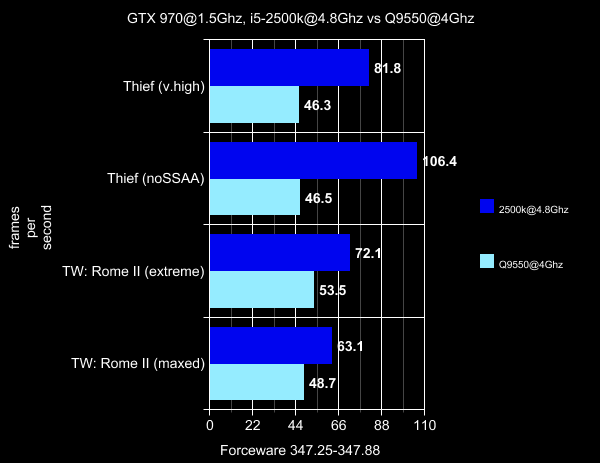 For now only the i5-2500k vs Q9550 results will be published, but I am halfway through for the i7-860. 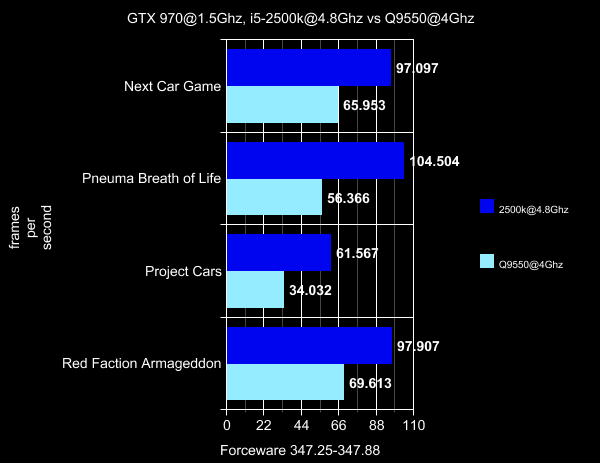 On the 860 I will only test the most cpu limited games/benchmarks. Lets go and see them one by one. First are the text based vbulleting results. All videos are recorded and uploaded raw at 1080p/60fps. I use an external recorder (Elgato HD 60) so what you will see in all videos is pure performance. I spend a lot of time in every video, showing the system and settings. You may want to skip that. 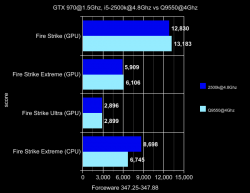 At the end of each video, I show the graphs from Task Manager and MSI Afterburner, with framerate, frametimes, cpu usage, etc. In some videos you will hear something that resembles coil whine. It is not. In my infinite wisdom I had passed my microphone cable underneath the case of one of my systems, right under the PSU. So every electrical disturbance the sytem created, the microphone captured it. 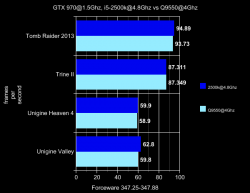 My 970 is dead silent. The quality/versus column, apart from giving you a basic info of the settings I used (every detail is recorded in the respective video links), also contains hyperlinks that will take you to youtube doubler, where you can see side by side comparisons of the runs. 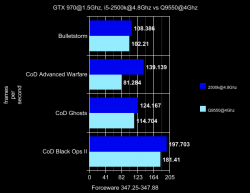 The difference of the hyperlinks in the columns, is that the ones with the numeric framerate results, lead to the video from the beginning, but the "versus" one takes you to the part where the benchmark started. 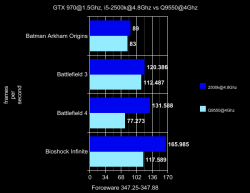 In videos that contain more than one result of the table (3dmark, AMD Demos, Lost Planet 2, Mafia, Call of Pripyat, Hitman Absolution, Just Cause 2, Rome II, UE4 demos) , the hyperlink of the result will take you to the beginning of the video, but the versus hyperlink will take you to the part that each respective benchmark starts. For the side by side hyperlinks, you can use ctrl+mouse wheel up to enlarge the windows, use pause to resync the videos when they go out of sync etc. 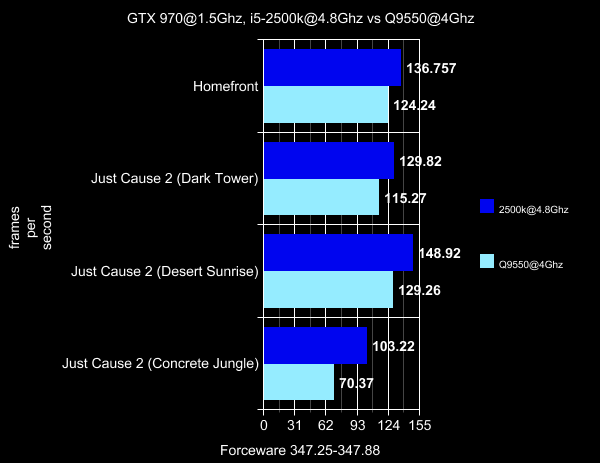 Ok I have followed the exact same path in my custom gameplay benchmarks, but I am only human guys. 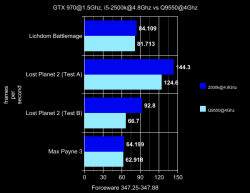 Hoping this isn't too confusing, here is the vbulletin text based table with the benchmarks. 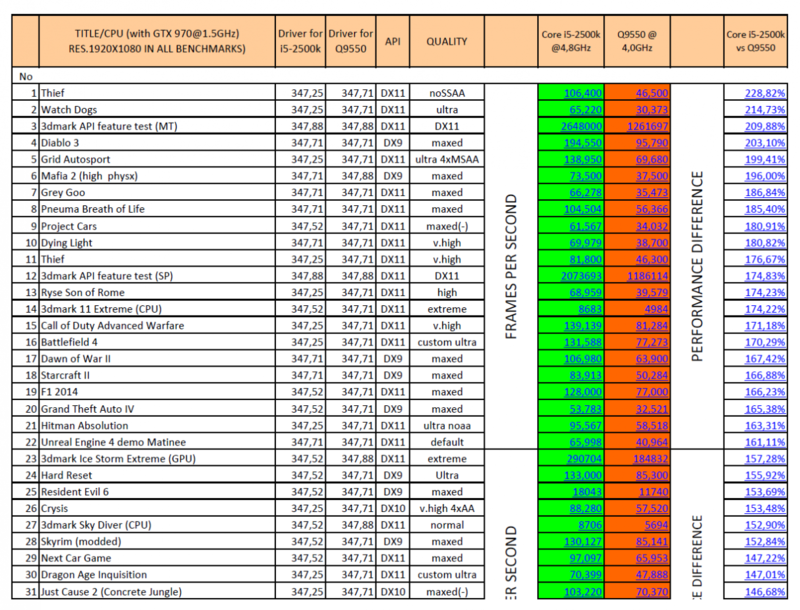 Of course results without the difference in percentage and a total average, are useless, so here they are. 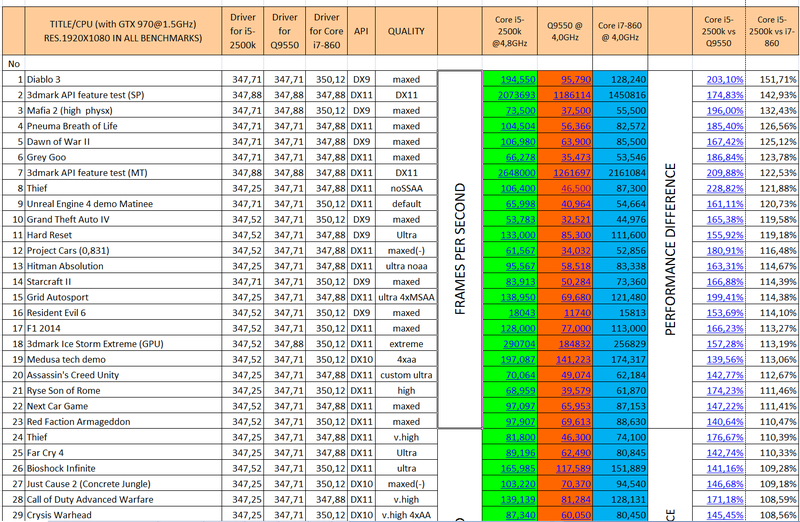 These are screenies from my excel file converted to PDF, for which I will also provide download links, so you can delete what benchmarks you don't want and build a result that suits you. They also contain driver info used for each bench as well as a general description of the settings. 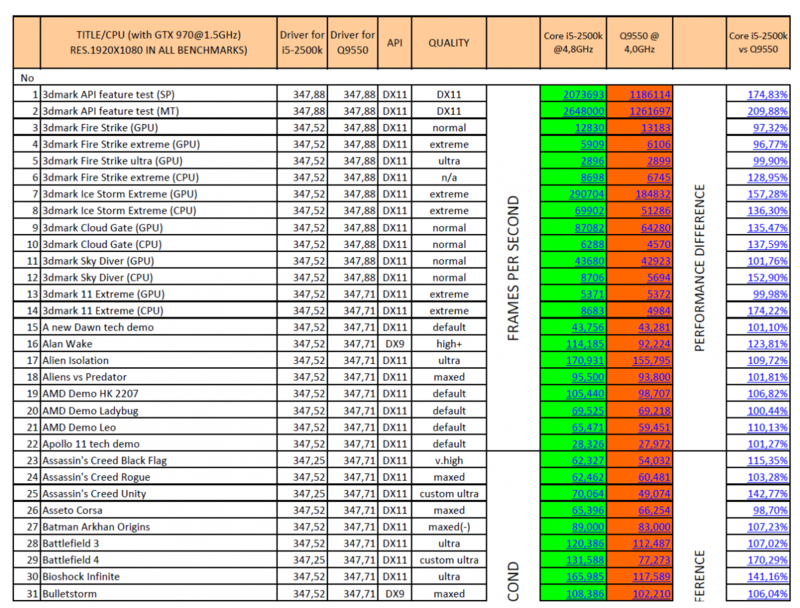 And here are the first 40 most cpu limited benchmarks, with their own average. The i7-860 tests will be based on these. 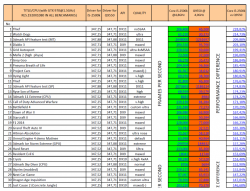 Here are the download links for the excel and pdf files for your convenience. 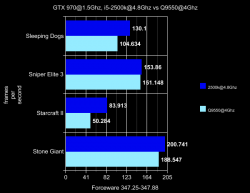 And last but not least, graphs! Lots of them! 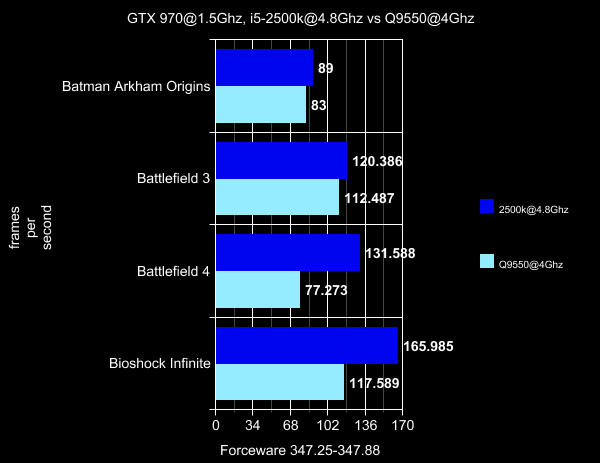 So this is the conclusion of this benchmark suite my friends. I hope it will be of value for some of you. 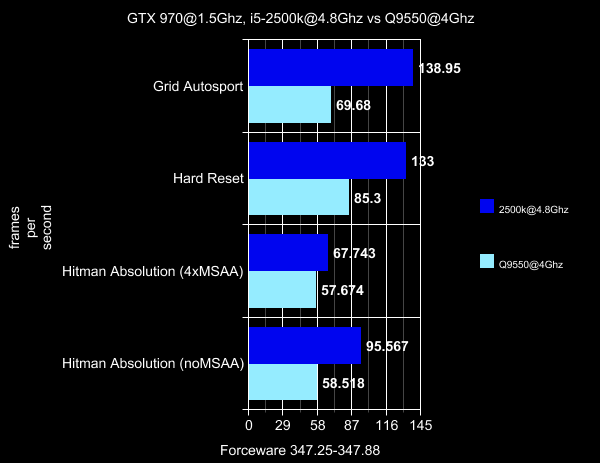 Will be back to add the i7-860 tests, for which I am very sorry that is not ready yet, but I've been constructing this test for a long time and I wanted to see it take some form finally. 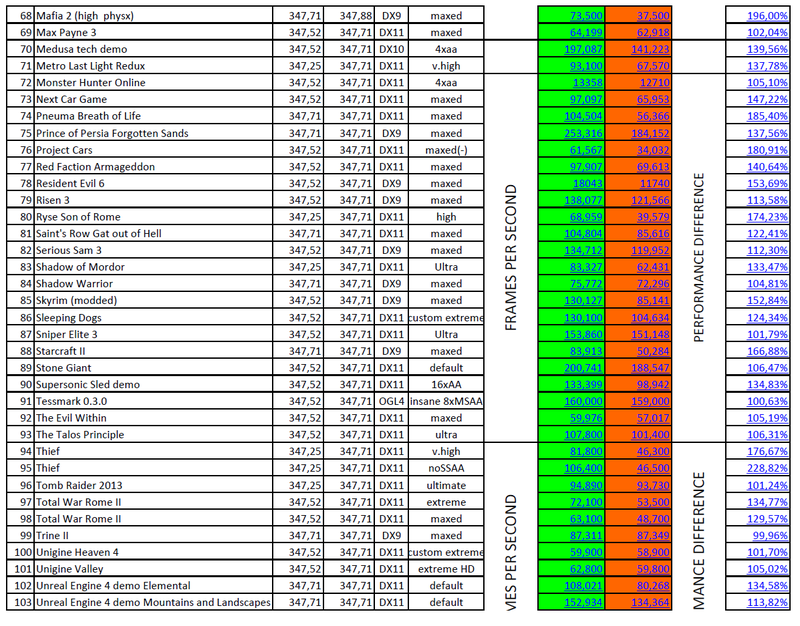 Needless to say that any constructive criticism, ideas, benchmarks that you would like added, are more than welcome. 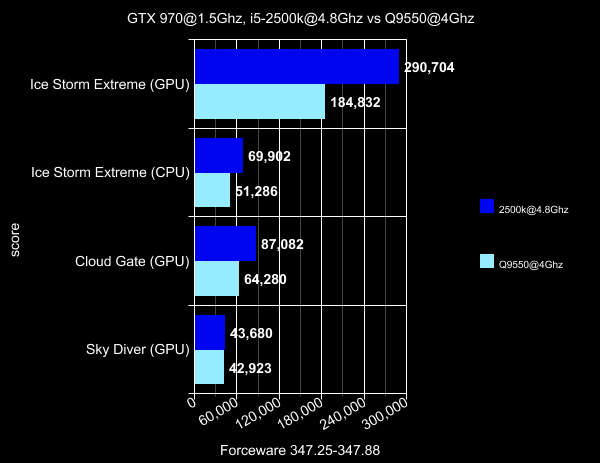 This would be a great way to discern the difference between GPU's across different systems if it could easily be summarized into a table like the HW compare GPU table. 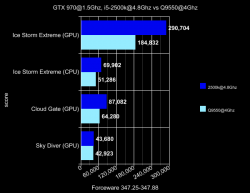 If you can just toss out the most CPU limited benchmarks and run the ones that seem to be well optimized you get get some real data with a system like this one. 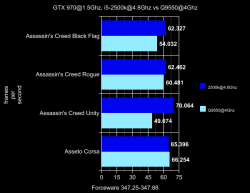 If you could get everyone to agree to just run the piss out of their CPU's before posting a GPU result it would pretty much dominate sites like http://www.hwcompare.com/that just take the product specs and compare them. With some real numbers it would be really killer. I think most modern CPU's should max out most cards with a decent overclock except in the cases of run away FPS. I am not sure if you want help but I will if you would like it. I would be interested in helping with some benching. 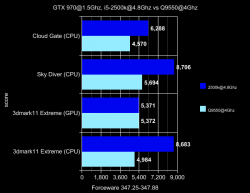 I currently have a GTX 960, 7970, GTX 660, and a 5770 floating around for the information pool. 2nd: Mother of walls, lol. 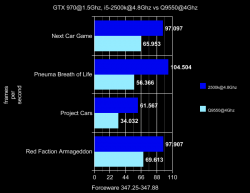 This could show how far behind AMD would be in terms of raw performance with its CPU department. 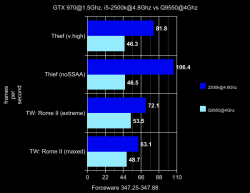 I would certainly be interested for such a benchmark. But kudos for this research! Looks like a ton of work. I can empathize with the time commitment it takes to run that many tests. 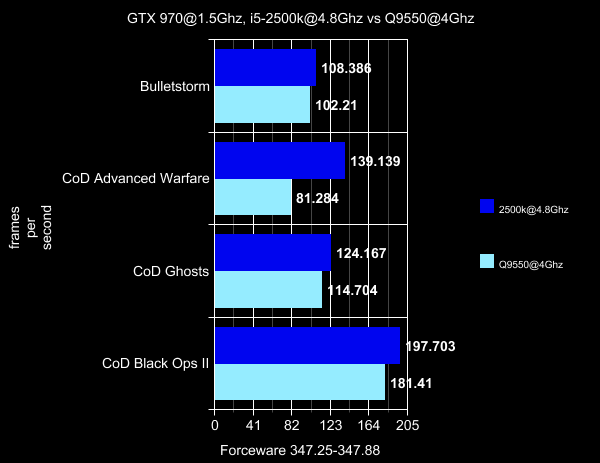 I did a Crossfire/SLI comparison a long time ago with 20 games and 11 multi GPU combos and 2 resolutions. But what resolution where the gaming tests ran at? Lots of work OP. That has got to be one of the most impressive first posts that I've ever seen. So a newer architecture cpu running ~20% faster, combined with a newer architecture (and more) ram running ~140% faster results in an average of ~30% performance increase. Seems about right. I wonder how much of that ~30% were results above 60fps where it didn't matter any way? Thank you all guys for your kind comments. Gabriel thanks for your offer. I do have access to other hardware as well. 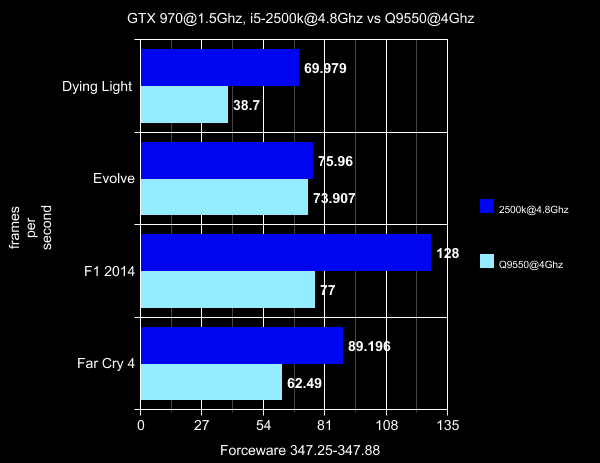 I still upload benchmarks for 7950/7950cfx/570 and 5850 in my youtube channel. 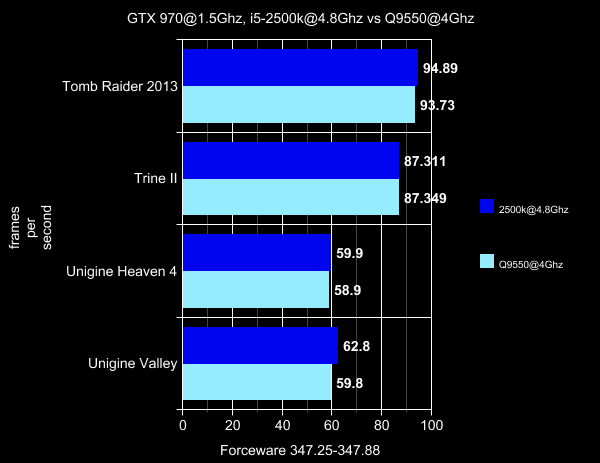 This test was just focused on how well or not an old cpu can perform with a newer gpu. 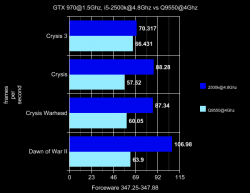 You know for people that cannot go for a full blown upgrade. The Lynnfield results which I will post later, will help even more I guess. WarWeeny, while doing this benchmark, this is exactly what I was thinking. How great it would be if I some FX processor for comparison. Maybe at some later point. Wevsspot, the 1920X1080 resolution is mentioned in the excel sheet screenshots, and of course in all my video descriptions, but I should have made a lot more mention of it. 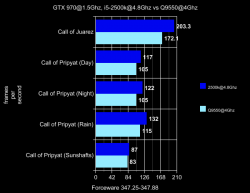 To be frank, I meant to include the resolution in the graphs as well, but I forgot. Thanks for pointing this out. 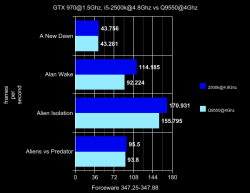 Fight Game, well as I said in the text above, this test was only meant to show how well an old CPU would fair, paired with a new GPU. The tests were meant to be GPU limited. 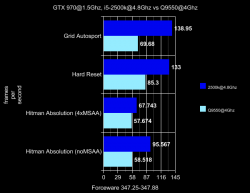 It was not a cpu test per se. We all know how much better a Sandy can be compared to a Yorkfield. 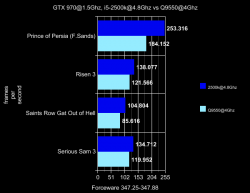 To that extent, you can see the sorted by percentage difference graph, for which I deleted the less cpu limited benchmarks. 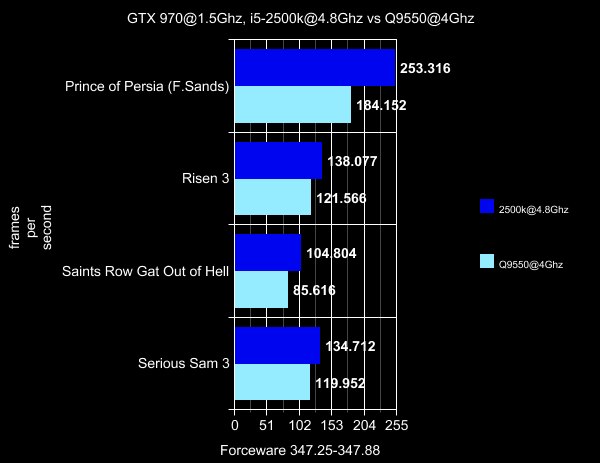 The Sandy does have the potential to be quite a lot faster, cpu frequency and architecture improvements included. I have AM3+ processors, Time is the enemy! 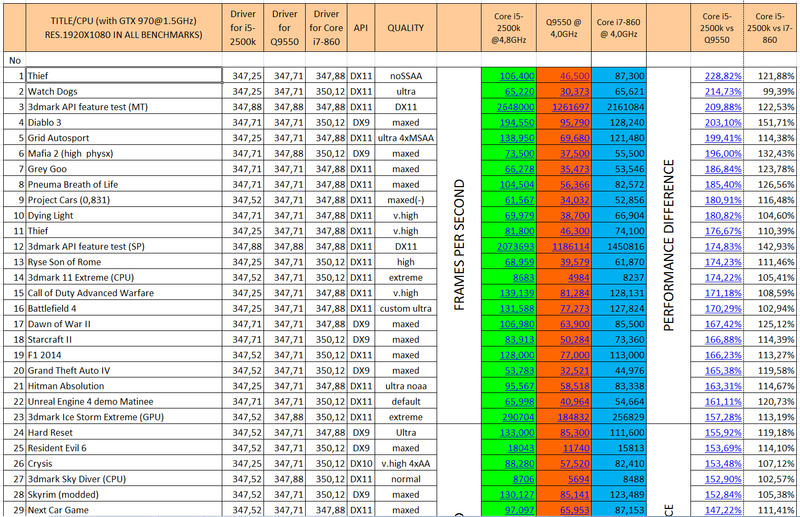 Ok guys, since I have had some requests to post some i7-860 results already, here is the sum up of the 2500k, Q9550 and Core i7-860, on the most cpu limited benchmarks of the original benchmark suite. 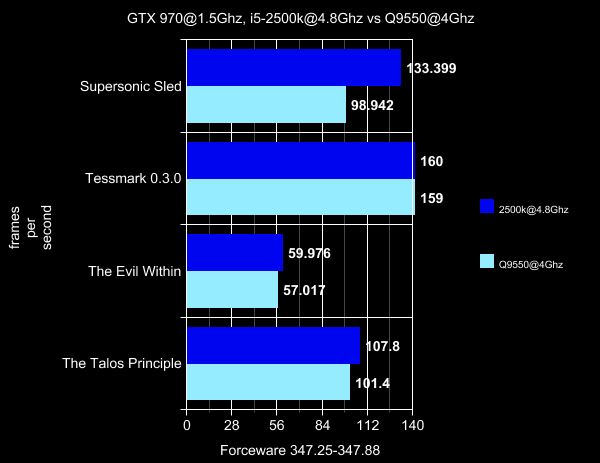 and here are the same results, sorted by the 2500k vs core i7-860 delta, from highest to lowest. 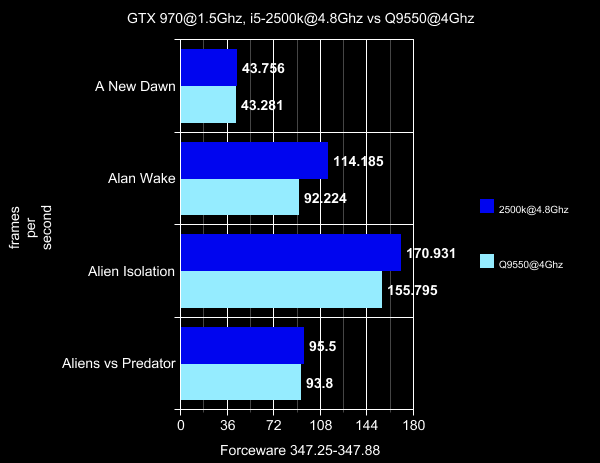 As you can see, the 2500k/Q9550 delta dropped from 63% to only 13% for the 2500k/i7-860 comparison. The clock difference of the [email protected] and the [email protected] is 4.8/4=20%, so for 20% more clock we only have 13% more performance. 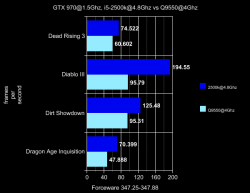 Of course this is due to the fact that this whole benchmark suite, is primarily designed to be GPU limited, with real life, very high settings, hence we have many GPU limits in all runs. At this point, I believe it would be interesting to redo every 2500k benchmark that has a delta of 20% or more compared to the 860, which would correspond to the operating frequency difference of the two cpus, but this time clocked at 4Ghz, as the i7-860 is. 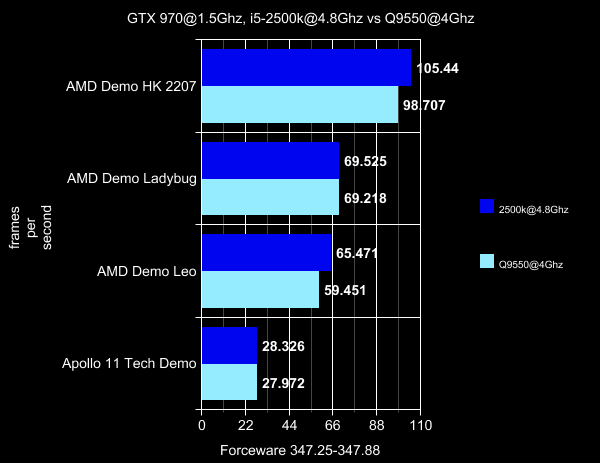 To stretch things even more, I could also disable the HyperThreading of the i7-860 for another run of these above 20% deltas, so we can see what a Lynnfield can do without the help of hyperthreading, but this is a story for another time I guess! Of course I will come back to post the complete version of this test, with graphs, bbcode with video links etc.